Did you know that June is Iced Tea Month? 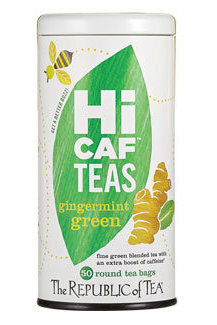 But with the huge celebrations of Ice Tea Month about to ensue, I guess now is a good time to talk about the sample of Hi-Caf Gingermint Tea that I got from my good friends at The Republic of Tea. I did a whole bunch of posts for them a while back, and recently they offered to send me some of their new Hi-Caf tea. Most of my tea drinking happens in the afternoon or evening, and usually I'm not interested in caffeinated beverages at that time of day. But, I'm one of those folks who is prone to migraines, and sometimes I wake up with one. Caffeine is supposed to be good for migraines, but along with the headache comes a wonky stomach, so my usual coffee isn't really a good idea. That's why I was so interested in the Gingermint Green tea. Both ginger and mint are soothing to the tummy, so I figured this tea would be the perfect hot caffeinated beverage for those migraine mornings. Funny thing is that I haven't needed it yet. But I've tried it and I like it. The ginger is present, but it isn't super-strong. Meanwhile, the mint is soothing. When it gets really warm, I'm thinking it would make a pretty good iced tea, too. Have you tried these yet? Do you like caffeinated teas? Disclaimer: I was sent this product as a sample. I was not required to write about it.